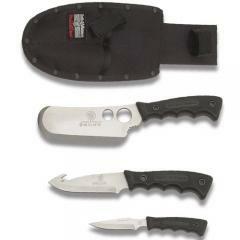 Carry every blade needed for a weekend in the woods with the Smith & Wesson SWCAMP Bull's Eye Campfire Knife Set. The three tool set features cleaver, guthook and caper knives to provide all wilderness essentials to clean and cook fresh caught game. The girth of the cleaver slices through large hunks of meat with ease, while the reinforced guthook cleans and dresses animals effortlessly. The classic caper knife tis designed to skin game with ultimate precision, leaving nothing to waste. Each blade is forged from genuine, stainless steel and features a full-tang construction to ensure long lasting service life without breaks, cracks or corrosion. Rubberized handles offer a secure grip regardless of weather conditions or wet hands. The kit includes a convenient, nylon belt sheath that comfortably holds all three knives for convenient storage and portability.